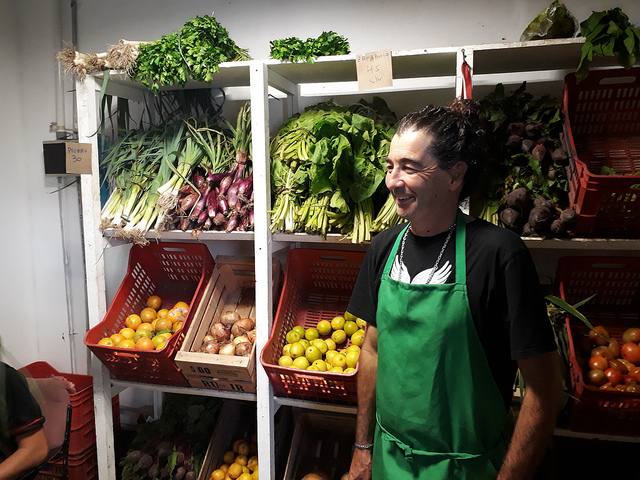 BUENOS AIRES, Jan 21 2019 (IPS) - “Our philosophy is based on two principles: zero tolerance of pesticides or bosses,” says Leandro Ladrú, while he puts tomatoes and carrots in the ecological bag held by a customer, in a large market in the Argentine capital, located between warehouses and rusty old railroad cars. Leandro and Malena Vecellio are a young couple who come every Saturday to the Galpón de la Mutual Sentimiento, a wooden building with a sheet metal roof used by farmers and social organisations for products to be sold in the “social economy,” located in the Chacarita neighborhood, on the grounds of one of Buenos Aires’ main railway stations. 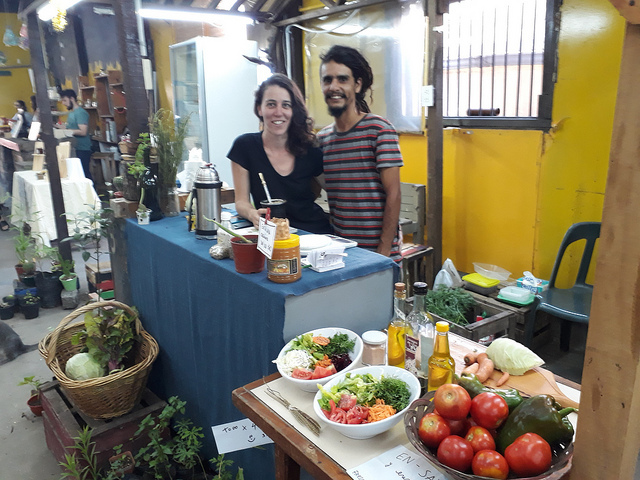 In the Galpón, family farmers sell their organic, pesticide-free products four times a week, with a share of their sales being discounted to pay the rent. In a country that in the last 20 years has devoted itself practically entirely to a model of agricultural production based on transgenic crops for export, with massive use of agrochemicals, this couple’s project, named Semillero de Estrellas (Seedbed of Stars), is an act of resistance. Transgenic products, which began to be planted in this agricultural powerhouse in 1996, cover about 25 million hectares in the country – three-quarters of the total area devoted to crops. Today, almost 100 percent of the main crops – soybeans and corn – are genetically modified, and most of the cotton is also transgenic. The industrial agriculture model is taking stronger hold, and in late 2018, the government approved the commercialisation of a new genetically modified food product, fully developed in Argentina: the first transgenic potato resistant to the PVY virus. In Argentina, transgenic agriculture is associated with a high level of agrochemical use. In fact, the use of herbicides, insecticides and fertilisers grew 850 percent between 2003 and 2012, the last year in which statistics were published. “In the area where we live, most of the small farmers walk around with a backpack in which they carry the agrochemicals that they spray on the vegetables. We do something else: we let the plants grow at their own pace,” Vecellio told IPS. The low level of sustainability of Argentine agriculture is reflected in the Food Sustainability Index, drawn up by the Italian foundation Barilla Center for Food & Nutrition and the Intelligence Unit of the British magazine The Economist. The ranking classifies 67 countries according to the average obtained in three categories: food and water loss and waste, sustainable agriculture and nutritional challenges. Argentina ranks 13th in the ranking (ahead of the other three Latin American nations included: Brazil, Colombia and Mexico), but its score is very low in both sustainable agriculture and nutritional challenges. Poor performance in these two areas is offset by good food and water waste ratings. Initiatives such as Semillero de Estrellas try to offset these two deficits. They farm on half a hectare of land in Florencio Varela, a municipality just 30 kilometers south of the capital, one of the poorest in Greater Buenos Aires. About four years ago, Ladrú and Veceillo began selling their organic products in the Galpón de la Mutual Sentimiento. First they traveled by train with their backpacks loaded with vegetables and fruit, and now they make the trip in their own vehicle, also carrying the organic pesticide-free vegetables produced by neighbors. Agrochemicals are generally associated with transgenic crops – most of which were designed to tolerate glyphosate and other herbicides – but they are also used in the production of fruit and vegetables by family farmers in Greater Buenos Aires. In this South American country of 44 million people, where agribusiness has grown exponentially in recent decades, agriculture accounts for 20 percent of GDP, including direct and indirect contributions. In addition, in the first half of 2018, soybean and corn exports alone contributed 9.7 billion dollars, or 32 percent of the total, according to official figures. But family farmers are hanging on, and play a decisive role in the local diet. And they are the battering ram for more sustainable agriculture and more responsible food consumption. According to data from the 2002 Agricultural Census, there are 250,000 family farms that produce 40 percent of the vegetables consumed in the country and employ five million people – about 11 percent of the country’s population. One of the flashpoints is the sale of products in the market. Ladrú explains that small farms are often worked by tenant farmers. “Tenant farmers work land that is not theirs. Then they give their harvest to the owner, who takes it to the Central Market and gives them half of what he earns,” Ladrú told IPS. “The problem is that when the owner can’t sell the vegetables, he ends up using them to feed the pigs and the tenant farmer doesn’t get any money,” he added. Access to land and credit is a huge obstacle for small farmers, despite the fact that in December 2014 Law 27.118, on the Historical Repair of Family Farming for the Construction of a New Rurality in Argentina, was passed, declaring the sector to be of public interest. That law created a land bank composed of public property to be awarded to peasant farmers and indigenous families, which was never implemented. State neglect has to do with the ideology that prevails in the government of center-right President Mauricio Macri, as noted in September by Turkey’s Hilal Elver, UN Special Rapporteur on the Right to Food, during a visit to Argentina. “During interviews with officials at the Ministry of Agroindustry, I observed a tendency of support geared towards the industrial agricultural model with the Family Agriculture sector facing severe cuts in support, personnel and their budget, including the lay-off of almost 500 workers and experts,” she wrote in her report. Elver urged the government to promote a balance between industrial and family farming. “Achieving this balance is the only way to reach a sustainable and just solution for the people of Argentina,” she said. Family farmers, in that context, are looking for ways to subsist. In the Palermo neighborhood, in an old municipal market with sheet metal roofing, various cooperatives that emerged after Argentina’s severe 2001-2002 crisis sell their products in the Bonpland Solidarity Market. “Our basic principle is that we are consumers of our own products. There is no slave labor, there is no resale, and everything is agro-ecological,” Mario Brizuela, of the La Asamblearia cooperative, which brings together some 150 families that produce everything from vegetables to honey and preserves, told IPS. 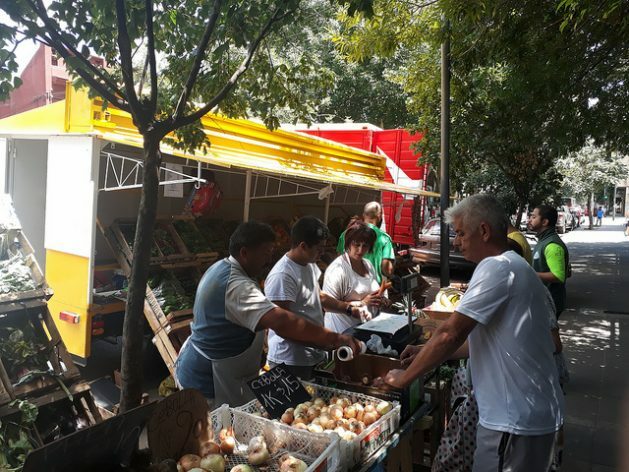 Another of those selling in the market is Enrique García, who arrives at the Palermo neighborhood with his truck loaded with vegetables from the Pereyra Iraola Park, an area of great biodiversity covering more than 10,000 hectares, some 40 kilometers south of Buenos Aires. “We have about four hectares that we share with my brother and all of us who work in the fields are relatives,” he told IPS as he showed a stem of green onions several times larger than the ones usually found in the greengrocers’ shops in Buenos Aires.